Kate was born at the Royal Berkshire Hospital in Reading, Berkshire, the eldest child of Michael Francis Middleton and Carole Elizabeth Middleton (née Goldsmith). Her mother was a flight attendant and her father a flight despatcher, though her parents run the mail order company 'Party Pieces'. The couple have two other children, Philippa Charlotte, known as Pippa, born in 1983 and James William, born in 1987. Kate's ancestry is mainly English, her paternal ancestors came from Leeds in West Yorkshire, her great-grandmother Olivia was a member of the Lupton family, who were active for generations in Leeds in commercial and municipal work. Through this side of her family it has been suggested that Kate may be related to the famous children’s author Beatrix Potter. Kate and William share a common ancestor in the fourteenth century monarch, King Edward III. An additional common ancestor is Sir Thomas Leighton. Sir Thomas married Elizabeth Knollys, a granddaughter of Mary Boleyn and was therefore great-niece to Henry VIII's second queen, Anne Boleyn. The Boleyn sisters’ mother was a Howard, a member of the family of the Dukes of Norfolk. Her maternal ancestors, the Goldsmiths, had more humble origins and were working class labourers and miners from County Durham. From May 1984 to September 1986, the family was based in Amman, Jordan, where her parents were working for British Airways. On their return to England, Kate was enrolled at St. Andrew's School in the village of Pangbourne in Berkshire, where she featured, aged ten, in in a school production of 'My Fair Lady'. Kate went onto Marlborough College, a co-educational independent school in Marlborough in Wiltshire, were she became captain of the hockey club and gained a reputation for quiet seriousness. Her education was completed at the University of St Andrews, where she met famously met her future husband, Prince William. Kate is reported to have first caught his eye when she modelled a skimpy sheer black lace dress in a university fashion show. The pair later went on to share a flat in St. Andrews. At St Andrews the two were protected from over intrusive tabloid scrutiny by an agreement between newspaper editors and the royal household. Graduating from university with a 2:1 (Hons) in the History of Art, Kate moved to London, setting up home in the capital and obtained a position as a junior buyer with High Street fashion chain Jigsaw. 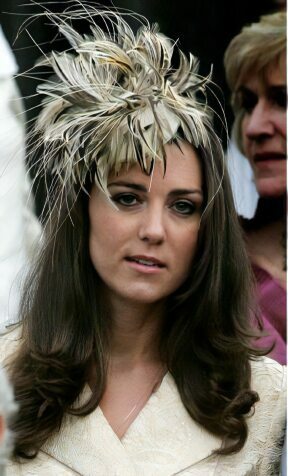 Kate's hobbies include recreational sports such as hill walking, tennis, swimming, sailing, photography and painting. The romance between William and Kate continued with Kate joining William, along with his father and brother, Prince Harry, on several skiing holidays. She was also presented to the Queen, who was said to have liked her grandson's choice of partner. Kate's status as the girlfriend of Prince William brought her widespread media coverage, which led her to complain through her lawyer on 17th October 2005, about harassment from the media, stating that she had done nothing significant to warrant such publicity. After much speculation in the press that William would soon propose to his girlfriend of nearly five years, the Sun newspaper broke the story on 14th April, 2007, that the couple had split up. According to newspaper reports, the decision to end the relationship was made during a holiday in the Swiss resort of Zermatt. There has been much speculation about the reasons for the split, which include that Kate felt William had not been paying her enough attention and that William had been photographed with other young women at a nightclub. William is on record as saying that he was far too young to marry. Some reports state that he had received advice from other members of the Royal family not to rush into marriage. By June of the same year they had, however, the couple resumed their relationship. Prince William finally proposed to Kate on 19th October, 2010, At Lewa Game Reserve, whilst on holiday in Kenya. The stunning sapphire and diamond engagement ring William gave her once belonged to his mother Princess Diana. Prince Harry issued as statement saying he was "delighted that my brother has popped the question!" adding "It means I get a sister, which I have always wanted." The couple married at a glittering ceremony on 29th April 2011 at Westminster Abbey. They were granted the title Duke and Duchess of Cambridge by the queen. The bride wore an Alexander McQueen ivory lace and silk gown designed by the label's creative director Sarah Burton, a detail that was kept secret until the day of the wedding due to Kate's wish that the gown would be a surprise for her husband. The couple set up home at a large but remote farmhouse, near Rhosneigr, on the Isle of Anglesey off the coast of North Wales, where Prince William is stationed at the RAF Valley base on the south-west coast of the island as a search and rescue helicopter pilot. On 3 December 2012, it was announced by St James' Palace that the Duchess of Cambridge is pregnant and expecting the couple's first child. The baby is due to be born in July 2013. New legislation will end the principle of male primogeniture, meaning that the first child of the Duke and Duchess of Cambridge will succeed to the throne, regardless of whether the baby is a girl or a boy. The legislation will also end the bar on anyone in the line of succession marrying a Roman Catholic. The couple's first child was born at 4:24 p.m. in the afternoon on 22nd July, 2013 at the private Lindo Wing of St Mary's Hospital in Paddington, London weighing 8lb 6oz. Prince William was present at the birth of his son. Both William and his younger brother Prince Harry were born in the same Lindo wing. Prince George of Cambridge is third in line to the British throne, after Prince Charles and Prince William, displacing Prince Harry in that position and is destined to become the 43rd monarch since William the Conqueror took the throne in 1066. The Duke and Duchess of Cambridge's second child, Princess Charlotte was born on 2nd May, 2015. A third child Prince Louis Arthur Charles was born on on St. George's Day, 23rd April, 2018.